Two of the main collections of Scots song are known as the Child Ballads and the Greig-Duncan Folk-Song Collection. 'The Child Ballads' is shorthand for the collection of 305 narrative songs classified by Prof. Francis James Child of Harvard University in Boston, USA, The English and Scottish Popular Ballads. This was published gradually from the 1850s, with the best known 'final' version appearing between 1882-1898. Child drew upon a myriad of ballad collections and manuscripts by people such as Bishop Percy, William Motherwell, Robert Jamieson, Sir Walter Scott and Peter Buchan, bringing together versions of songs collected in various parts of Scotland and England and comparing them to similar ballads elsewhere in other European traditions. While debates have raged amongst academics regarding the reliability of some of the collections Child used - fashion used to dictate that 'vulgar' ballads were 'tidied up' for publication - or the fact that some ballads were excluded, it remains a vital resource for folk singers from the Scots- and English-speaking worlds. Songs sometimes become known by the 'Child number', e.g. The Twa Sisters is Child 10. Child's collection, like many of its predecessors, was published almost exclusively without musical notation, so the ballads have often been interpreted and studied as poetry. However, they were almost certainly all sung. The Child ballads were largely out of print until the 1960s when they were reprinted by Dover Publications in paperback, and more recently by Loomis House Press, incorporating for the first time all of Child's appendices into the main text, available in Scotland from Springthyme Records. In the late 1950s Bertrand Harris Bronson of Princeton University undertook to marry Child's collection with more recent collecting, mainly in North America, resulting in The Traditional Tunes of the Child Ballads. Later volumes of the work incorporated tunes collected from Scots singers recorded for the emerging School of Scottish Studies sound archive. Also out of print for a considerable time, Bronson's work has recently been republished, also available from Springthyme Records. The Greig-Duncan Folk Song Collection consists of over 3000 versions of songs collected by schoolmaster Gavin Greig (1856–1914) of Newmachar, Aberdeenshire, and the Rev. James Bruce Duncan (1848-1917) of New Deer. Whilst it contained many of the aforementioned Child ballads, the Greig-Duncan Collection is important as a broader reflection of song types in currency with Aberdeenshire singers in the early 20th century. For much of its life, the collection was unpublished and largely inaccessible to the general public. Child ballads from the collection were published in 1925 as Last Leaves of Traditional Ballads and Ballad Airs, edited by Alexander Keith. Greig's columns of folk song from the Buchan Observer were reprinted in 1963 by his descendant Arthur Argo, with Kenneth Goldstein, as Folk-Song in Buchan and Folk-Song of the North-East. Greig and Duncan's full collection was eventually organised and published in 8 volumes from 1981-2002 by the Universities of Aberdeen and Edinburgh. Under the editorship of Emily B. Lyle and the late Pat Shuldham-Shaw, the collection is arranged thematically, including bothy ballads, nautical songs, military songs, songs of parting. Interestingly, several of the later volumes were co-edited by singers including Adam MacNaughtan, Andy Hunter and Sheila Douglas. In 2009, a 'singers' edition of 150 songs selected from the Greig-Duncan collection was published by John Donald/Birlinn, edited by Katherine Campbell. Orpheus Caledonius, by William Thomson, 1733, available online at the National Library of Scotland Digital Archive. Volume 1 and Volume 2 at the Internet Archive. Volume 1 / Volume 2 / Volume 3 at the Internet Archive. Charles Rogers' Modern Scottish Minstrel, multiple editions from 1855 onwards. Volume 1 at the Internet Archive. all at the Internet Archive. John Ord's The Bothy Songs & Ballads of Aberdeen, Banff & Moray, Angus and the Mearns, published posthumously in 1930. 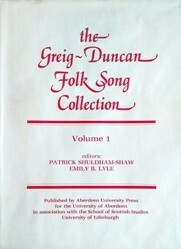 Modern collections include Norman Buchan's 101 Scottish Songs (1962), which became known as the "wee red book" in the Scottish folk revival, and the book he co-edited with Peter Hall, The Scottish Folksinger (1973). Nigel Gatherer's collection Songs and Ballads of Dundee is also a significant collection, first published in 1985 and again in 2000.